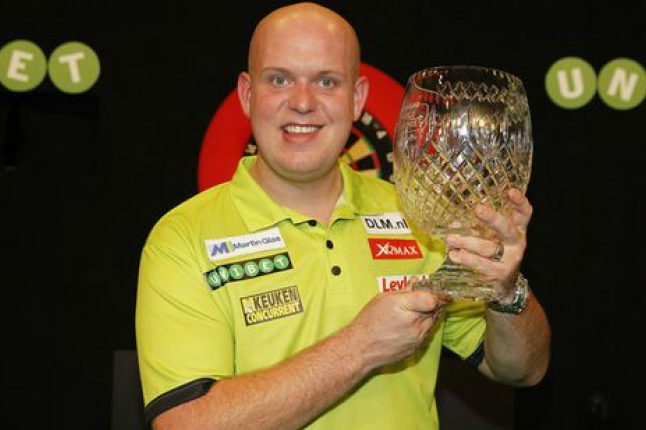 Van Gerwen holding one of his trophies aloft. Credit @pinterest.com. Recently, the European Championship of darts occurred, competed between the world’s top ranked players. 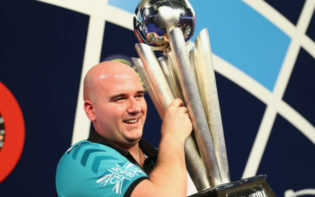 Amongst these was Phil Taylor, 16-time World Champion, and Dutchman Michael Van Gerwen, both of whom seemed to be amongst the favourites for the trophy, predominantly due to their vast array of previous tournament victories. Whilst both players seemed to play at a high standard, the tournament seemed to be most notable due to the emergence of Austrian Mensur Suljovic who, even though he held the number two seeding, had yet to reach a final of a rankings event, a record he surpassed by finishing runner-up in the tournament. Yet, it seemed Van Gerwen, winning his 22nd title of 2016, emerged with the plaudits. The tournament was competed between 32 darts players from across Europe, although was predominantly made up of British and Dutch players. In the opening round, the players from these nations seemed to dominate, with Van Gerwen, Wilson and Bunting all averaging over 99 in their matches. Yet, the first round also saw the emergence of Suljovic, whose average of 104.26 was only better by Phil Taylor. The Austrian then became one of only two players outside of Britain and Holland to reach the quarter-final, where he met Taylor, and emerged victorious after a seemingly accomplished performance; after reaching the final after a win versus Peter Wright, Suljovic accomplished his best ever performance in a rankings tournament, yet seemed to also be seeking the record of becoming the first player outside of Britain and Holland to win a major PDC event. 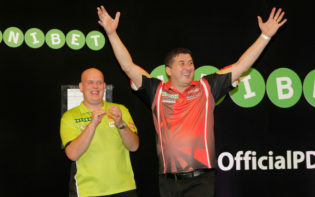 As such, the final was contested between Van Gerwen and Suljovic and, even with Van Gerwen’s pre-tournament billing seeming to deem him the favourite, Suljovic’s advance to the final, at the expense of 16-time World Champion Phil Taylor and world number five Peter Wright, seemed to suggest he possessed the capabilities to claim the trophy. Yet, Van Gerwen seemed to showcase the form contributing to his status as world number one, opening the tie with a score of 174, before holding his throw in the second leg to head into a 2-0 lead. The Austrian did checkout double nine to narrow the gap, yet it was ultimately the top seed who would halt his quest for the title. The world number one went on to achieve two 12 dart finishes on the Austrian’s throw and this, coupled with checkouts of 110 and 15, seemed to act as the catalyst in the Dutchman’s 11-1 victory. Van Gerwen celebrating winning a leg. Credit @pinterest.com. 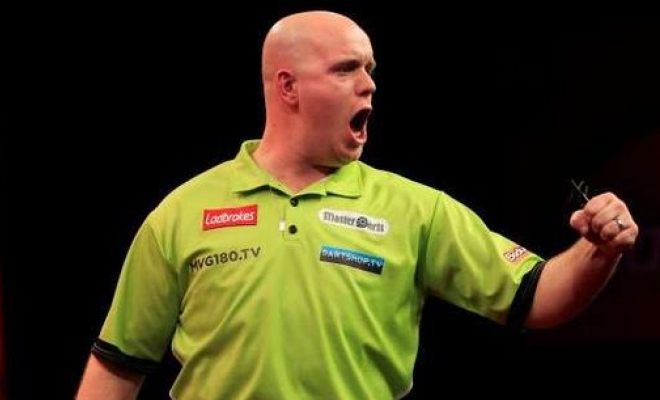 Van Gerwen, with victory, added to his smorgasbord of titles, and may have simultaneously reinforced his legacy as one of the most accomplished darts players in history. He has achieved 12 career nine-darters, five of which have been televised, placing him second in the all-time list. 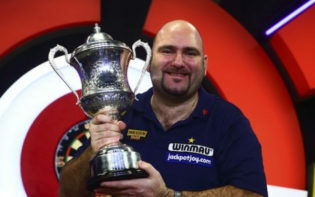 He has also won the Premier League twice, the World Matchplay twice, and on three occasions has won the World Grand Prix; all of these victories seem to have contributed to him amassing over £1.3 million in prize money in 2016 alone. Ultimately, his 20 major wins, and his number one ranking at the age of 27, seem to have contributed to the suggestion he has the potential to achieve a place amongst darting’s elite, simultaneously becoming the most accomplished player in history. The European Championship is amongst the final tournaments in the year and, with Van Gerwen claiming his third consecutive trophy, he may be looking to utilise this experience in order to gain victory in the upcoming World Series Final. Yet, it seems other players may be able to productively utilise this experience, most notably Suljovic, who has risen to number seven in the world rankings. 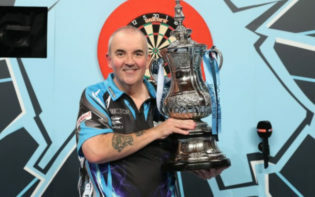 With players including Suljovic seeming to emerge as title contenders, perhaps the elite of darts players, including Phil Taylor, may face a fresh challenge, as these emerging talents may be seeking to dislodge the elite by replicating their achievements. Ultimately though, with Van Gerwen once again claiming victory, it seems he is playing at his peak ability, and may possess the talent to dominate the sport, and simultaneously surpass records set by previous world champions. How might Michael Van Gerwen build on his achievements in 2016 in order to challenge Phil Taylor’s record of title wins?